China has unveiled what it bills as the fastest rail link in the world -- a train connecting the modern cities of Guangzhou and Wuhan at an average speed of 350 kilometres an hour. The super-high-speed train reduces the 1069 kilometre journey to a three hour ride and cuts the previous journey time by more than seven and a half hours, the official Xinhua news agency said. Work on the project began in 2005 as part of plans to expand a high-speed network aimed at eventually linking Guangzhou, a business hub in southern China near Hong Kong, with the capital Beijing, Xinhua added. "The train can go 394.2 kilometres per hour, it's the fastest train in operation in the world," Zhang Shuguang, head of the transport bureau at the railways ministry, told Xinhua. Test runs for the service began earlier in December and the link officially went into service when the first scheduled train left the eastern metropolis of Wuhan on Saturday. 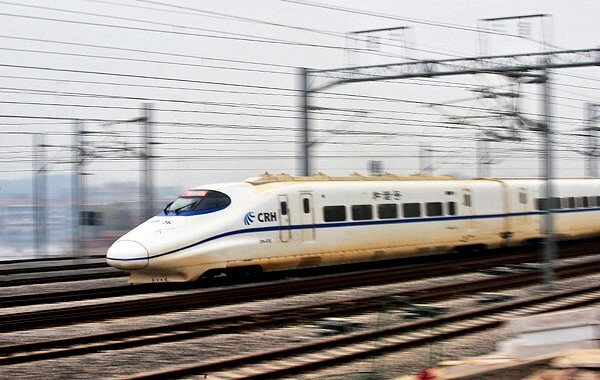 By comparison, the average for high-speed trains in Japan was 243 kilometres per hour while in France it was 277 kilometres per hour, said Xu Fangliang, general engineer in charge of designing the link, according to Xinhua. Beijing has an ambitious rail development programme aimed at increasing the national network from the current 86,000 kilometres to 120,000 kilometres, making it the most extensive rail system outside the United States. China unveiled its first high-speed line at the time of the Beijing Olympics in 2008 -- a service linking the capital with the port city of Tianjin. In September, officials said they planned to build 42 high-speed lines by 2012 in a massive system overhaul as part of efforts to spur economic growth amid the global downturn. The network uses technology developed in co-operation with foreign firms such as Siemens, Bombardier and Alstom.